Start Highway 431, 6.6 miles northeast of Highway 28 and 1.5 miles southwest of Mount Rose Summit. This is where Ophir Creek intersects the highway and just north of the trees that border the south side of Tahoe Meadows. 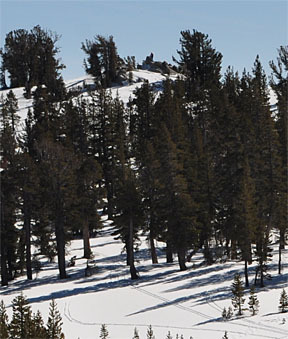 The addition of Peak 8843 to the Ophir Creek tour results in a unique mix of beginner meadow skiing with intermediate peak skiing. But what makes it outrageously fine is the 360 degree panorama from the summit followed by a descent of an amazingly perfect intermediate downhill slope. At the farthest point along the tour you have a view east down to Washoe Lake. The ascent and descent of the peak is over open terrain with a uniform slope. 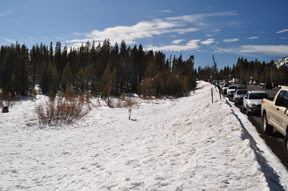 Due to the southern exposure of this slope, the snow consolidates rapidly here and the lack of many travelers over this section means that you are likely to fine excellent snow conditions on a warm day after consolidation occurs. In addition, the entire slope between the ascent and descent shown on the map is almost treeless providing much room to make turns at your whim. From the trailhead (1) ski east and then slightly south of east along Ophir Creek for a total of 0.7 mile until you reach trees that divide the path ahead into two possible routes, the obvious open one along the creek and the other one slightly to the north through scattered trees (2). Continue east along the creek for 0.3 mile until you reach the point where the route ahead is obviously better by veering slightly north and slightly up from the creek (3). Continue east along the north side of the creek and slightly above it for 0.2 mile until you reach the point where the creek drops abruptly as it continues east (4). Retrace the route west for 0.2 mile until you reach mileage point (3). Ski slightly north of west through well-spaced trees for 0.1 mile until you reach a point from which you can easily ascend north to Peak 8843 (5). Climb north for 0.3 mile until you reach the summit of Peak 8843 (6). Descend southwest for 0.4 mile until you reach level terrain (7). 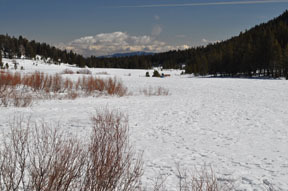 Ski west for 0.6 mile until you reach the trailhead (1).